2010 Atlanta Symphony Show House & Gardens. 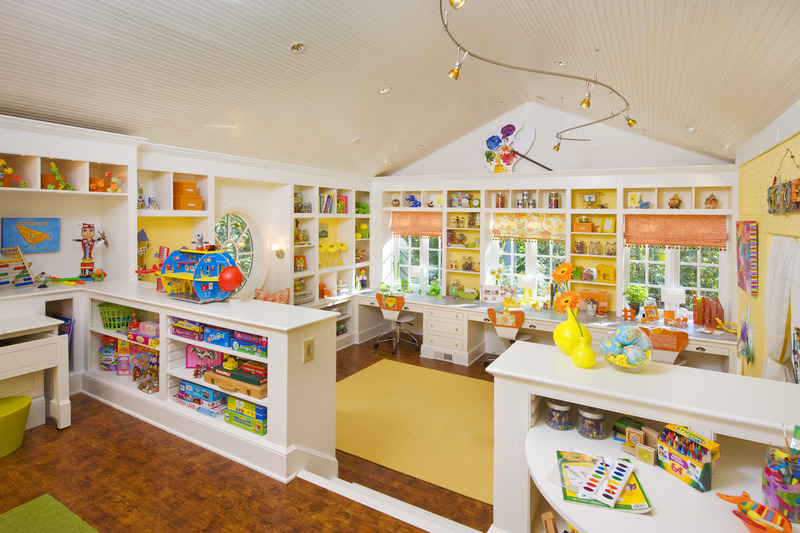 Kids Craft Suite designed by Margaret L. Norcott, Allied ASID - Principal of Milieu Design Group, Inc.
My inspiration was the space itself, as well as, the fabric I selected for the "middle" desk space which created a domino effect after for other fabrics, art and accessories. As well, I wanted to show case real artist work and recycled projects/art that kids could identify with and feel they could possibly make themselves. I don't have a style (personally speaking) but I love to mix styles from all periods to create an acquired, timeless look. Paint color was Crowne Hill Yellow, by Ben Moore, for all accent areas. Painting was done by The Paint Doctor (.com) and they painted about 5 other rooms for Designers in the house as well. Great job! Fabrics from F.Schumacher & Co., Duralee.com and Kravet Fabrics; Carpet tiles by FLOR.com; Lighting from C-Lighting (shop in Buckhead/ATL, GA); Desk Chairs/Coat Rack/Desk Lights from Room & Board (.com); Womb Chair and Mi-Lin Green Stools (& more) from Knoll (.com), Folk Art supplied by matildascottage.com in Alpharetta, GA; Recycled Art from re-Inspiration (Atlanta, GA). "EVERYTHING!" Every single detail and item in this room mattered to the overall feel of the space. It took crafts, desk supplies, children's art work, hand puppet, recycled art and custom designed draperies/pillows/seat cushion and chair "jackets". Many of the items in this room were crafted by artist but as my theme of the space stated, it was so that a child could feel like they too could make (or closely do so) that picture or what have you. If you can sew, you can create a similar desk "jacket" for your child's chair. If you have paints, get a canvas and let your child go wild and create whatever they wish ~ it will personalize your space. I also kept the colors to about 4 (yellow, orange, green and white as a base/neutral). I can’t imagine having such a large and gorgeous space to work with! Job well done. Oh-Em-Gee!!! Can I drool? This is dreamland! Look at all those shelves and all those colors! Oh, there are also board games. This room is really amazing and wonderful. I wish my kids could have a crafts room, too. It would really encourage them to make beautiful things using their hands. With a craft room like this? Which kid won’t turn crafty? This space is really inspiring. The window seat is to die for! Who wouldn’t go gaga over space like this?! This is the perfect organized room! Love the storage, windows, and colors! Margaret L. Norcott, Allied ASID brings a broad spectrum of knowledge from her Interior Design, Sales/Management and Marketing backgrounds. Her professionalism, personal commitment, enthusiasm and meticulous attention to detail are reflective of her vast experience. 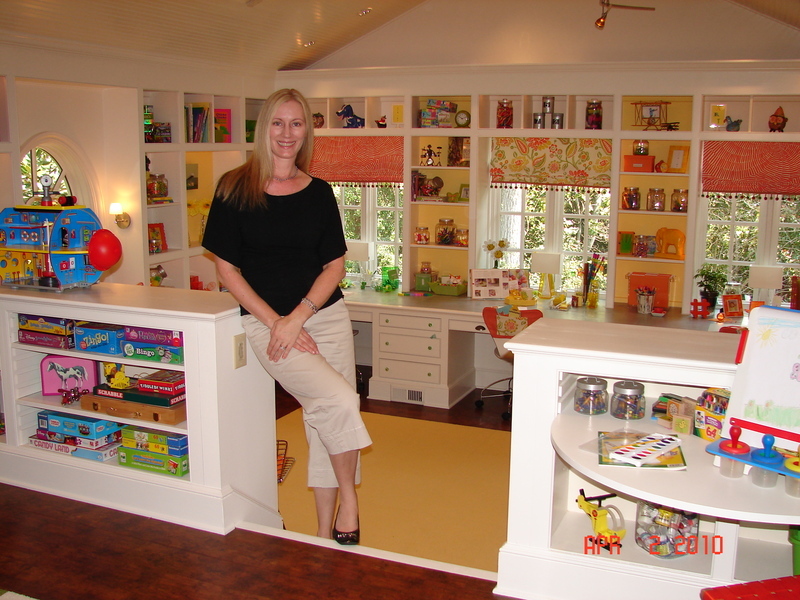 Margaret graduated from the University of Florida in 1993 with a Bachelor of Design in Interior Design from the College of Architecture. During two summers, Margaret interned in Miami for Jeff Howard & Associates where she worked on such projects as: Costa Cruise Ships (The Daphne renovation) and on professional golfer Ray Floyd's new home. After graduation, Margaret worked in Miami for Bermello, Ajamil & Partners, a leading design firm in the area. There, she worked on the new American Airlines Admiral's Club Room at the Miami International Airport, as well as the new entrance for Dolphin Cruise Ships terminal at the Port of Miami. She moved to Atlanta in 1994 and began working for Amtico Flooring as their Lead CAD Designer. Due to the growth constraints within Amtico, she decided to venture out on her own. Margaret started Milieu Design Group, Inc. in 1996, where she focused primarily on small commercial space planning, as well as, provided local custom homebuilders design services and advice for their client's. In 2002, she decided to try a career change and went to work for House & Home Interiors as an Interior Designer. Her main focuses were on Client and "New" Builder/Developer relationships, Interior Design and to assist with Model Home Designs (H&H provided Model Home Design services to Hedgewood Properties). In January 2003, Margaret returned to "her company" with new vigor and direction for its focus. MDG, Inc. now provides its customers with the following services: Residential Interior Design, Builder Specifications, Real Estate Staging, Commercial/Office Space Planning. MDG, Inc. is broadening their scope of work to include Model Home Design. Margaret has also been a "featured" Designer in the 2003, 2004, 2005 and 2006 Alliance Children's Theater Guild Christmas Show House, as well as the 2005 Dream Home that was held in Country Club of the South and the 2007, 2008 and 2010 Atlanta Symphony Decorator's Show House & Gardens. Margaret's Interior Design skills provides Milieu Design Group, Inc's customers with the latest in the Interior Design arena, along with, new technology that accompanies her profession. MDG Inc's design process begins with an overall concept for the project and focuses on the client's need first and foremost. She creates unique environments with a timeless aesthetic by mixing different styles with items that are very old and architectural in nature. The goal, is to come up with a personal look for each client's environment. All this knowledge and information ensures that her clients needs have been met within the Scope of the Design process, which ultimately ensures a smooth transition into their new environment. The result at the projects completion: Interior Design details requested by the client have been addressed from start to finish, on time and most importantly, within budget.